When building a diy Hot Wheels race track, you’re really building four parts. The start gate, the drop, run-out, and the finish line. The track itself will just be Hot Wheels orange track, what you're actually building is everything around it. Keeping the orange track straight and even is the goal of “building” a “track”. There is no right way to do it. Let your creativity and imagination run wild. That being said, here are a few suggestions if you’re just getting started. First, you want something that your orange track can sit on and the easiest thing here is wood. There are two option that I have used. Either can be found at places like Home Depot or Lowes. One is just the standard common pine boards, the other is the primed MDF boards. The pine boards are a little cheaper, but finding straight unwarped ones is tough. The MDF boards are a little more expensive, but they are nice and straight. Remember, Hot Wheels track is 1.5 inches wide, so use that as you decide how wide of a board to get. A 3.5 inch board (usually labeled as 4 inches wide) is perfect for an easy two lane set-up. that’s 3 inches for track and a ¼ inch on each side for track guides. For the track guides I use ¼ square dowels glued with wood glue. The two lanes of orange track fit in between them perfectly. I’ve used other widths of board and I think it looks sharp to have lane guides separate the lanes too. Just do the math. I usually use square dowels, or another thing that I have used is a ¾ inch wide by ¼ high vinyl molding. Here is my 4 lane track with each lane separated by the 3/4 inch vinyl molding. When I use the vinyl molding I use small nails to secure it to the board, with wood stuff I usually just use a good wood glue. I have found that the easiest way to connect the drop with the run out and the drop support is with hinges. That makes it easy to adjust the height and slant as well. Use a little extra board on the bottom of the drop support to give your track some more stability. The design that I like best for a start gate is basically a hinged door that swings out. 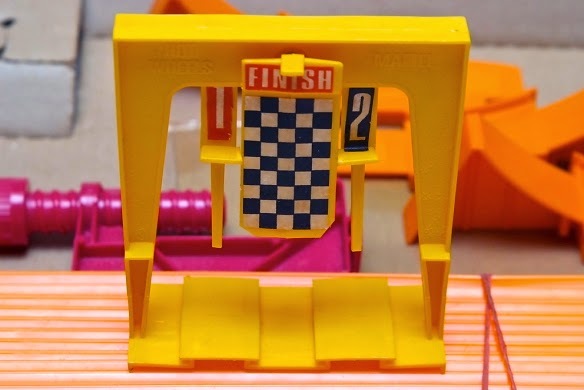 The other option is to have something drop out of the bottom of the track (like most cheap Hot Wheels brand start gates) but unless it swings out, I don’t feel that it gives the fairest start. Classic Hot Wheels start gate. Push the button and the pegs drop down and release the cars. So for an easy start gate, two boards on the side, one on the top for a hinge. Then a “door” on the front to hold the cars back. That’s pretty much it. Now for the details. For the door, I like to use a Lexan Polycarbonate sheet. It’s clear and allows you to see the cars lined up at the start. I usually cut it with my electric jigsaw. Just make sure you use a fine toothed blade. I usually cut the bottom so that there are “tabs” sticking down in each lane to keep the cars back. I try to mount it so that there is only a small bit of clearance between the tab and the track. Start gate on my two lane "King of the Hill" track. Start Gate on my 4 land "Color Country Speedway"
Sometimes I will also use my Dremel with a round sanding bit to make clearance grooves that are tricky with the jigsaw. Attach the door to the start box with a hinge. Start gate on my 2 lane "King of the Hill" track. Start gate on my 4 lane "Color Country Speedway". Make the top of the door stick up a bit so that you have something to pull on to open it. To attach the Lexan door to the hinge, you can use small bolts, but they stick out the front, or you can use a piece of wood on the front of the Lexan and then use screws. I like this method as it look a bit cleaner and gives you a place to put some cool stickers, lane markers, or the track name. A good finish line is usually the trickiest part. There are a few Hot Wheels finish lines from other sets that you can pick up either by buying the set or off of Ebay. With these you are kind of locked in to a certain width for your track. 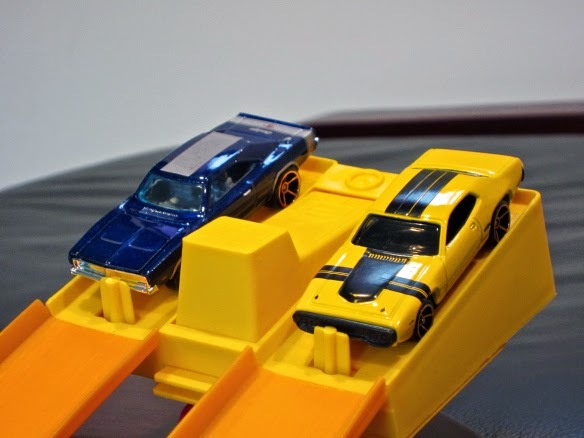 Probably the most popular Hot Wheels finish line is the classic yellow one. You can find these on Ebay pretty easily. Classic Hot Wheels finish gate. The center flag falls to the side of the winner. I modified a Hot Wheels 4-lane Raceway finish line for one of my tracks. This finish line is cool because it not only tells who the winner is, but it tells all 4 places. This one is a little harder to come by and the tracks on Ebay are a little more pricey. This track is not sold in stores anymore. 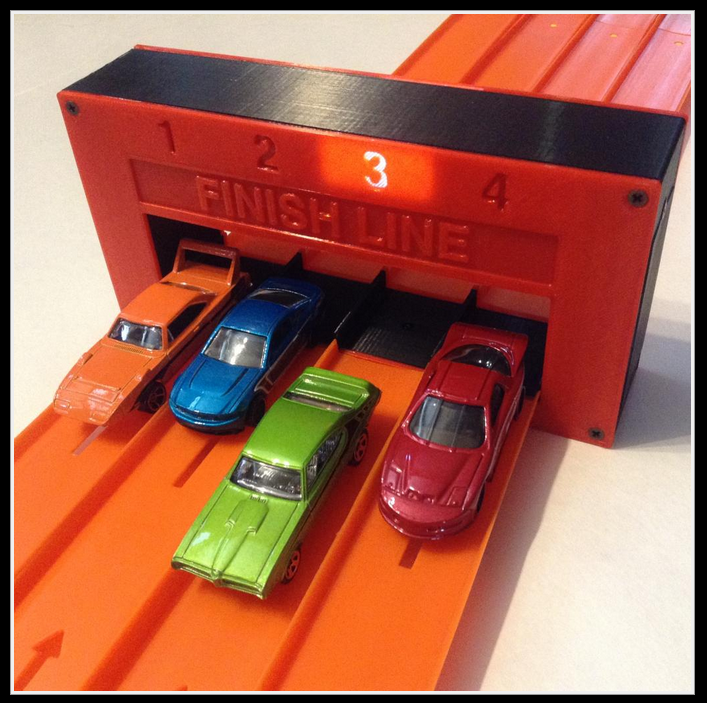 Another finish line that is popular is the one from the Hot Wheels 6-Lane Raceway. The 6 lane finish line doesn't tell the order of all six lanes, it only tells which lane was the winner. This set is also not sold anymore, but can be found on Ebay. It is really pricey. 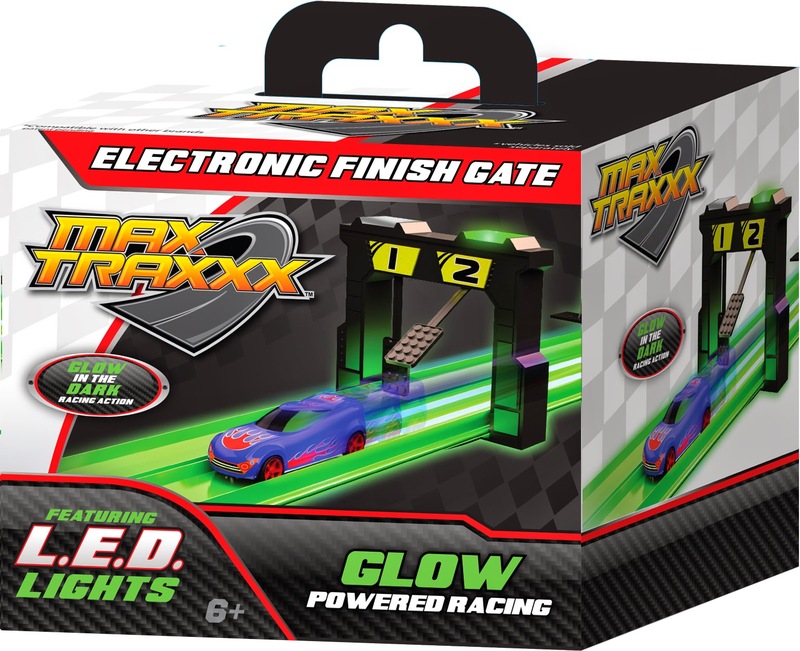 Another new option for a finish line is the Max Traxxx finish gate. It is a two lane finish line with an LED that lights up on the winning lane. It is compatible with Hot Wheels orange track and is a great price. I just picked up a couple and so far...so good. Again, you're locked into a particular width, but these will work great with the 3.5 inch set-up described above. 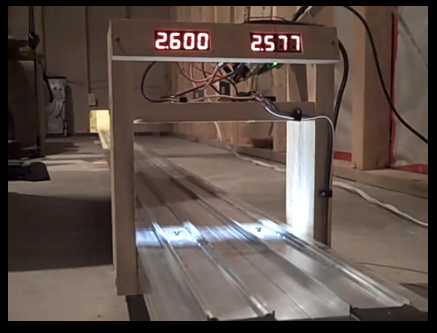 Another option that is usually pretty pricey is a Pinewood Derby finish line. 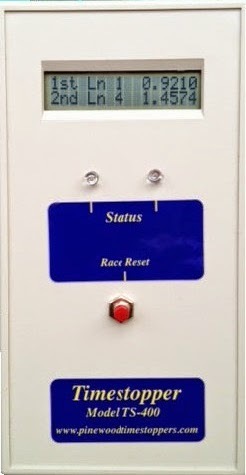 These are usually run with computer software and will not only tell you the winner, but also the times for all the cars. Here are a few Pinewood Derby Timers out there that would work for Hot Wheels tracks. These timers are small hand held units. Various models. A 2 lane version that tells place and time is about $190. 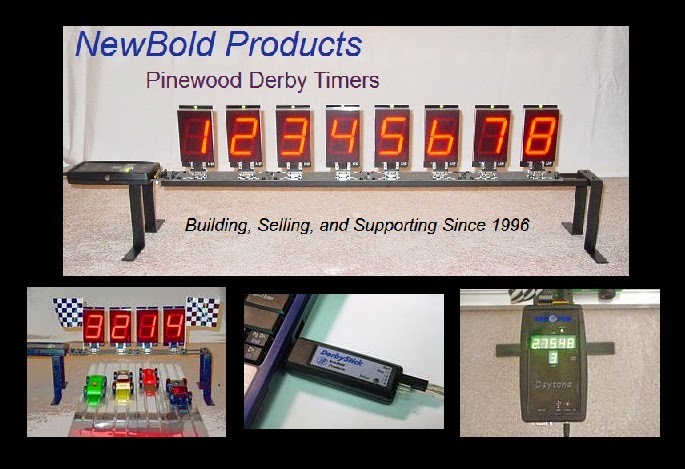 Numerous option from their more affordable Derby Stick Timer and Turbo Lite in the mid $100 to $200 range to their more elaborate set-ups in the $200-$500 range. I have the Derby Stick Timer and it is a great affordable option. Different versions from flashing lights, to places, to times. Also offer kits to build yourself to save money. 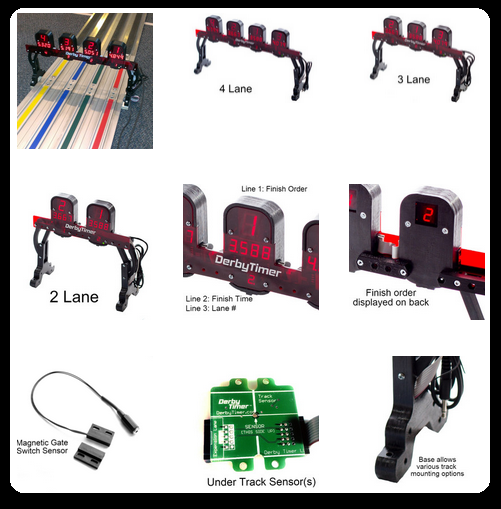 Starting in the low $100s for single lane kits, to the $400s for 6 lane timers. The Judge timing system with a number of different options ranging in the mid $100s on up depending on options selected. Nice timer that shows place and elapse time. In the $200-$300 range. 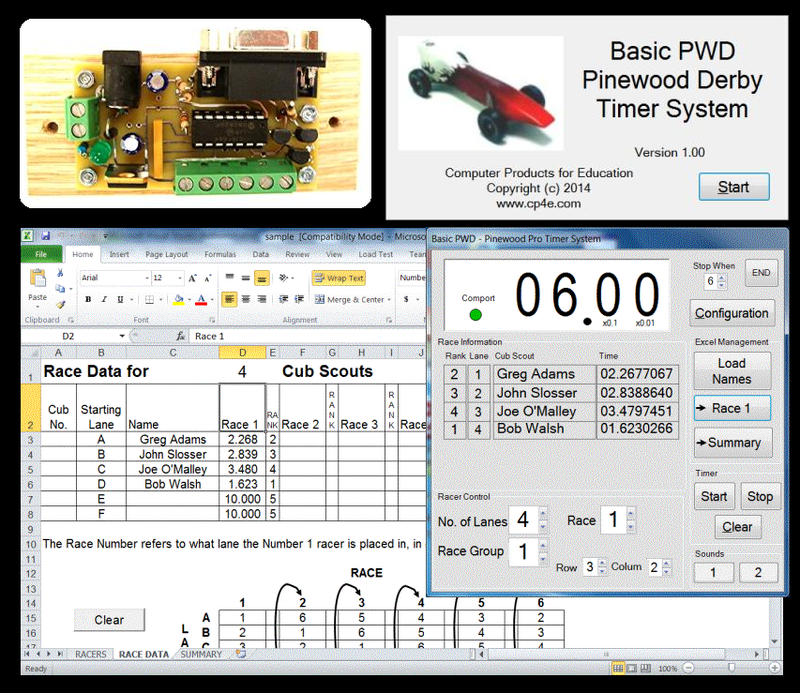 A basic timing system that uses Excel as it's race management software. Four lanes for $169. If you’re handy and like to build things, there are a multitude of options out there for building your own finish line, from mechanical options to those that require little electronics knowledge, to those that might require a bit more electronics knowledge. Here are some links to a few of those. Arduino based two lane finish line with LED showing the winner. Fairly easy with limited electronics knowledge. 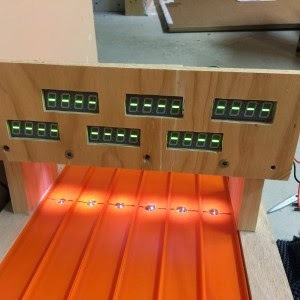 Arduino based 4 lane finish line with LED showing the winner. 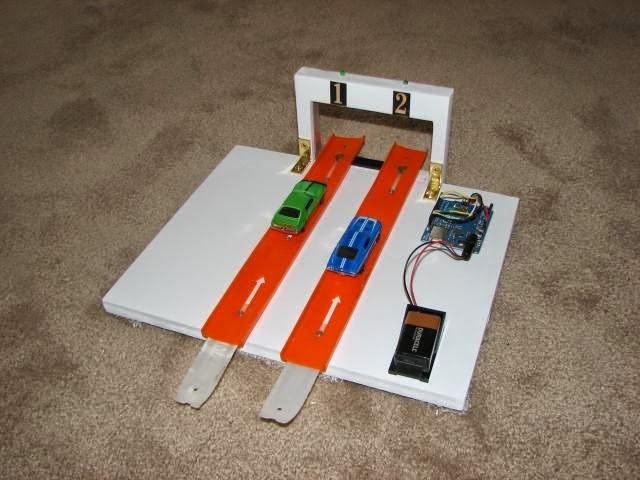 Based on the Instructables finish line above but with Arduino code for 4 lanes. Fairly easy with limited electronics knowledge. Arduino based timer for multiple lanes. LED displays for time and place. To implement all components requires a bit more electronics knowledge but not terrible complicated. based on the “miscjunk” model above. More info and video always helps. So, we've talked about the start gate, the drop, the run-out, and the finish line, lets hit a few more details and you’ll be racing on your own track before you know it. Keeping the track in place. 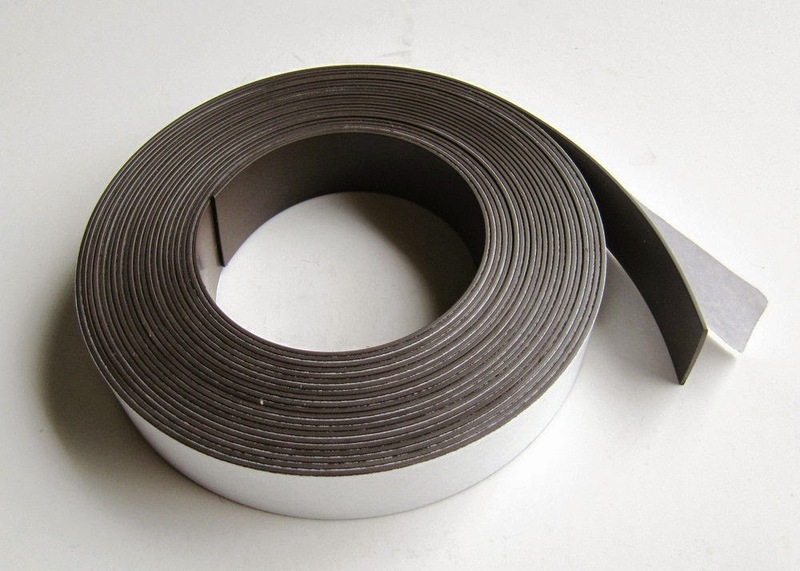 You may not need anything to keep your track in place if you have build it with some track guides, but if you do need some help keeping it straight and in place, Velcro works pretty good. I always use a little Velcro at the transfer to keep things in place. I usually put a piece above and a piece below the transfer. I get the sticky back kind so that it’s easy to apply. Sometimes I use regular Velcro and sometimes I use the Command “Velcro-like” strips. I've also used Popsicle sticks to keep track straight. One inch washers fit nicely inside the grooves of Hot Wheels orange track. 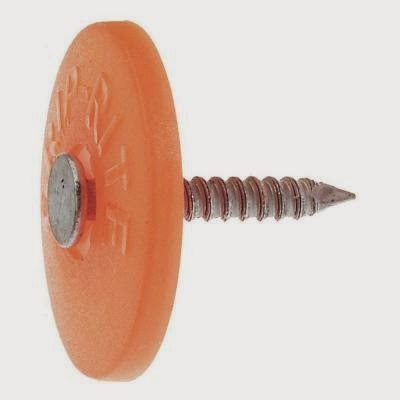 These should work great if you put a smaller washer under the 1 inch washer to provide some space for the track and nailed or screwed them down to the wood. This could work in the same way as the washer method above, the plastic washer just comes with the nail. Get the self adhesive strip magnets and put some on the board and some on the track. You probably want something to stop and “catch” the cars at the end of your track. Maybe it’s just the carpet. Maybe a towel or pillow will work for you. My favorite thing these days is a rice bag. A rice bag is just a bag filled with rice. Your basic rice bag could be just a ziplock bag filled with rice, but a more durable option is to sew up some fabric with some rice in it. I've also built a couple of stop boxes so that once the cars hit the bag they don’t fly off the track but they stay contained in a padded space. However you stop the cars, it should be a way that absorbs the energy so that the cars don’t get damaged. The length of your track will probably be determined by how much room you have. Also how much space you can dedicate to your track will play a role in determining how long each section of track is. Longer sections of wood make it easier to keep your track straight, but if you need to be able to break it down and “put it away”, then shorter pieces are going to be better. You can connect each section with straight mending plates that can easily be screwed on. You can also connect each section with Velcro. Rubber bands wrapped around screws can also work. Obviously, the higher your drop is, the faster the cars will go. Some people love speed, so they want a high drop. Myself, I love races, and I find that I get much better races, even some exciting come from behind victories with a lower drop height and a long run-out. With a lower drop height I get to “see” more of the race and cheer a bit. Drop height is a personal preference. My 30 foot track has a drop height of about 3 feet. Most of my shorter tracks have a drop height of around 2 feet. Whatever height you choose, don’t make the angle too steep. That makes the transition hard on the cars. If your drop height is over two feet, I’d make the drop length six feet or longer. A 4 foot length will work for a two foot high drop, but longer works well too. You can use magnets to help keep the gate closed until you open it. Hopefully you have found this helpful and are well on your way to building a track to race on. Racing Hot Wheels and other diecast cars is great fun and can be enjoyed at any age. We'd love to see pics of your tracks that you build. You can post them on our Facebook page or the Forum. Keep Racing and we'll see ya in lane two! What Makes a Fast Hot Wheels Car? Welcome Hot Wheels lovers. This site is designed mainly to showcase our races, however, you can also find some general information about collecting and racing Hot Wheels and other 1/64 scale diecast cars. Make sure you like the Facebook page to stay up to date on all the news and racing events. We host both local and mail-in races, so like the Facebook page, post pics of your cars, talk some trash (keep it family friendly) and get ready to race! Check out Diecast 64 on YouTube! Be sure to subscribe to our YouTube Channel to see all our latest videos! If you love racing Hot Wheels, you've come to the right place. Most of our races are mail-in races so you can participate from anywhere. Subscribe to our mailing list to stay informed on all our races! Want to make your Hot Wheels car faster? Join the Hot Wheels Pick'em game for fun and prizes! Check out this great racing community!